Generally, at least for the last 12-18 months, the USDA has been relatively predictable in monthly and quarterly reports. 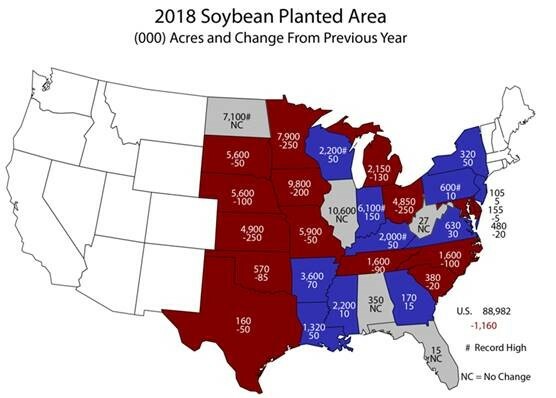 Today was an outlier – the USDA Perspective Plantings and Quarterly Stocks reports caught many in the marketplace off guard. When numbers are published that are widely different from what the market is expecting, we experience volatility. Today, the acreage numbers were lower than many expected and the stocks numbers were higher than many expected. First, let’s walk through the acreage numbers. Average trade guesses for corn acres were 89.4, between 87.6 and 91.0. USDA projects 88 mln acres. While this is still higher than the lowest estimate, it is still lower than the average trade guess AND 1.2 mln acres below last year’s number. The average estimate for soybeans was 91.1 mln acres with a range of 89.9 to 92.6 mln acres. USDA projects 89 mln acres, 2.1 mln acres below estimates and 1.1 mln acres below the average trade guess. These numbers caught the trade off guard, causing a subsequent rally of 14c in the corn market and 26c in the soybean market. Sifting through some e-mails and reactions, it’s a bit tough to digest that corn & soybean combined acreage is 3.0 mln acres light of last year. 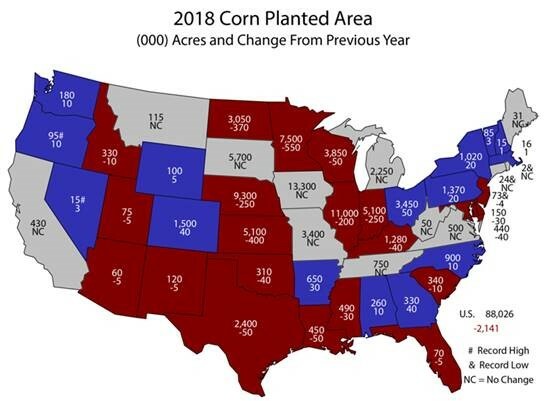 We have until June to straighten this out; we also have until June to argue about the estimates… At any rate, below are maps of state-by-state acreage changes for corn and soybeans. Moving on to stocks, 2nd quarter corn stocks (on March 1st) were 8.888 bln bu of corn. The average trade guess was 8.703 with a range of 8.550-8.881. Soybean stocks were 2.107 with an average trade guess of 2.030 and a range of 1.810-2.110. Both corn and soybean stocks numbers were either on the top end or larger than expected. This highlights some lags in domestic consumption and raises concerns about our export pace. Quarterly stocks reports give us an “idea” of what livestock feed consumption is. It appears that the large hog and cattle numbers have yet to affect our national corn and soybean inventories. We may see the livestock feeders put more of a dent in our stocks numbers in the next quarter. At the end of the day, the major story was the low acreage numbers. Plugging these numbers into a ‘18/’19 Supply & Demand balance sheet can yield some interesting results, mainly lower corn ending stocks numbers. This all depends, of course, on what we actually plant and actually yield, so at this point such exercises are little more than extrapolation. The best thing to do is to take advantage of price rallies and put price goals in place – so if / when we achieve those price levels, opportunity can be seized. We want to wish everyone a Happy Easter and safe holiday weekend. The CBOT is closed tomorrow in observance of Good Friday. The market will resume trade on Sunday at 7PM.